now they are voting on whether the swiss govt pays farmers to keep the horns on the cows and not cut them off. Wacky!! 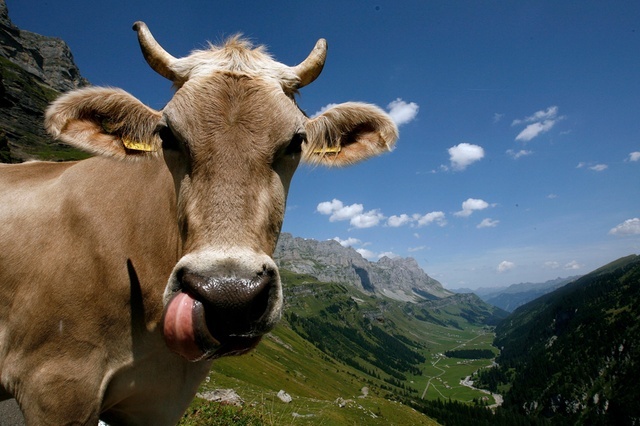 In switzerland, only about 10% of cows have horns. Yet the images in swiss advertising and tourism literature suggest otherwise. The initiative has been rejected, 54.7% No vs 45.3% Yes. Only 4 2/2 cantons voted for, 16 4/2 against. As a reaction to this initiative I would love to see a ban on the cruelty of cutting off horns of live animals. I voted against- despite really hoping Swiss cows will continue to have horns. But it has not place in the statute book. The 45.3% show that these horns should stay on. This is a subject of animal protection imo and it's high time they get their butts up about it. Why are dogs better protected than cows? Do any dog owners receive money not to abuse their dogs? This was not about if the horns should stay on or not, this was about if all taxpayers should give money to farmers who leave them on. I am also against such way of funding it. Give people the choice and have a symbol on the package that shows if it is from horned cows or not, and thus give us the choice, if more people are willing to pay a bit more than more cows will keep their horns, if not they simply are in bad luck. Exactly. That's the question that should have been asked, not this ridiculous idea to pay people not to be cruel! The horns create an actual danger in the barn, and when a horned mother cow-protects its offspring on a meadow by attacking a hiker the potential consquences are obvious. We all have heard about cows attacking hikers, it looks like a few get killed each year in all German speaking countries together. See this attack on a German police officer for example. Ok, they're all wussies to begin with, but still. Now imagine the same with a horned cow attacking an elderly hiker, without a car that can be used for protection - holy cow!